Graydon Parrish offers a range of color theory instruction and consultation. He has taught extended workshops at various private and public institutions as well as lecturing on related topics at the New Britain Museum of American Art and the Blanton Museum of Art. His workshops are attended by diverse groups: professional artists, movie industry techies, art historians, accomplished actors, fashion insiders and seasoned art collectors. All are enthralled by the possibility of learning a reliable system for mixing and applying color. Currently, he offers one to two week studio classes as well as weekend color symposia exclusively for charitable causes. Please contact the artist of more information. 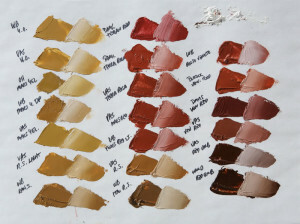 Parrish, a realist painter in the classical tradition, has for many years resolutely researched the color theories of painter Albert Henry Munsell (1858–1918), the creator of a color system based on rigorous studies of how we perceive color. Now in the forefront of adapting Munsell’s scientific concepts for use in painting, Parrish offers an annual workshop on the topic at the Grand Central Academy of Art in New York City. Last summer Parrish introduced 15 eager participants to the practical use of this unique, numeric system for accurately describing every color that exists. 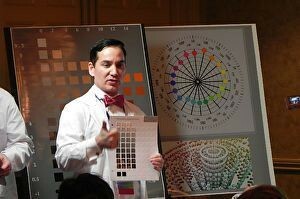 Munsell’s color theory is complicated, heady stuff, to say the least, but after three weeks of intensive study under Parrish’s guidance, each student had completed a complex series of color-mixing and painting exercises and came away with an arsenal of workable solutions for identifying color by its dimensions of value, hue and chroma. Parrish set the tone on the first day by announcing that the workshop would be a collaboration: “We, as a class, represent a variety of levels and artistic experiences,” he explained, “so I would like to treat the next three weeks as a lab and encourage everyone to work at his own pace—but also to share with the class any new ideas uncovered as we progress.” With that in mind, he met privately with each student to determine his or her skill set, tailor a personal curriculum and designate homogeneous groups—ensuring that each artist would be adequately challenged.